This isn’t the story I had planned to file today. I was working on an interview with someone I photographed back in March when the Weather Channel intervened. When I was looking at our pool deck last weekend, I notice that some of the bolts holding our screen enclosure to the concrete pad had started failing. A bunch of them broke off during the 2004 hurricanes, and I replaced them before the 2005 season hit. Unfortunately, they, too had rusted and popped off since then. When I went to bed last night, there was a 70% chance that we might see Bonnie headed our way. I needed to replace the failing hardware. I decided to replace them with stainless steel Tapcons and washers this time. Ouch. That stuff’s not cheap. Of course, then I had to go out and buy a new hammer drill to install them. The first one I picked up was missing a part. That meant a trip to the store to replace it. Mid-way through the project, I snapped off a drill bit. That meant another trip to the hardware store. I developed a Rule of Threes for home repair projects: Every project takes three times as long as anticipated; costs three times as much as budgeted and requires at least three trips to three different hardware stores for every item needed. This is a long, weather-related version of “the dog ate my homework” to explain why you’re seeing these mystery photos instead of the interview. 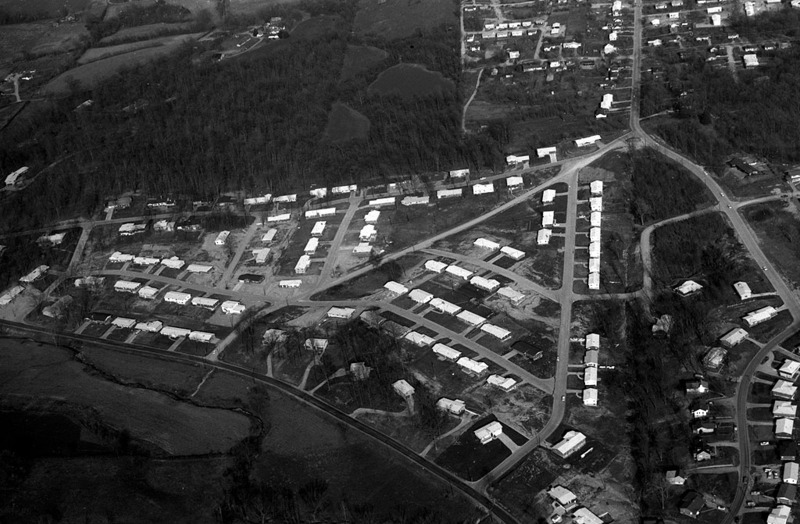 Just so you won’t disappointed that there’s nothing new up, I decided to post these aerial photos of a unidentified housing development. Here’s a slightly different angle of the area. There’s a small creek running down the left lower portion of the photo, but I don’t recognize any of the roads. There are no big buildings or water towers to help, either. The only info I have is that the pictures were taken April 14, 1964. There’s a bridge in the middle of the photo crossing the stream, but I can’t tell if it’s a car or a railroad bridge. It’s possible it’s the old bridge over the Diversion Channel near Blomeyer. What’s happening with the storm? It took me about an hour, but I figured out the subdivision and the roads. It is the Oak Hills subdivision. The road at the top of the picture and going towards the bottom is Bertling St. Perryville Rd. is at the bottom right of the picture and Cape Rock is at the bottom left of the picture. Some of the new streets in the subdivision are Westridge, Huntington, Colonial, Forest View, Bel Air, Oak Hills, Crestview, and Lynhurst. The open field at the bottom of the picture is where there is a Lutheran Church now. BINGO! You guys nailed it. I pulled up a Google Map and confirm your ID. Ernie Chiles would have been my pilot, and that’s his neighborhood. That’s probably why I shot it when we flew past it. Sorry to keep you up so late, Mark. I pulled up Google Earth to look at the Bonus Round photo. The more I look at it, the more I’m convinced that it does show the old Diversion Channel bridge on 25 south of Dutchtown. You can see the levee on the south side of the waterway. Mark is absolutely spot-on regarding the first photo. The picture was taken looking east-southeast. Look at this map for reference. The second picture is of the FRISCO railroad bridge across the Diversion Channel just northwest of the Cape Municipal Airport and directly south of the instersection of MO-74 and Bloomfield Rd. 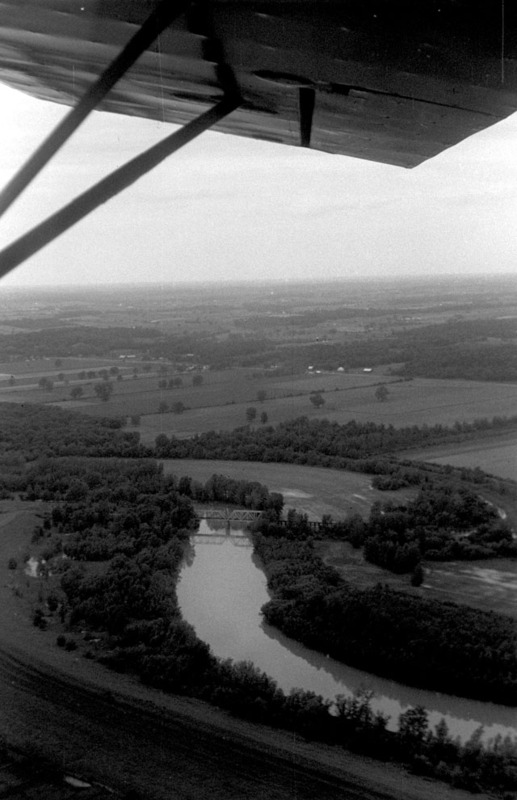 The picture was taken looking northwest. This map will help. You’re right. I was close when I said Diversion Channel, but the RR bridge makes more sense. In the photo above, I see the curve before the bridge, a straight section and then a sharp curve. The 25 highway bridge I thought it was goes straight after the bridge. I may have to throw up some more mystery aerials since you solved these so quickly. Yes, that is Oak Hills and thsi must have be taken before our hosue was built in 1964…the empty (1624 Oak Hills Drive)lot is still there! that would be the forth house (lot) down on Oak Hills Drive…Ernie Shiles lived for a while on Oak Hills drive the second house…He was probably scouting for homes in your flight! Everyone loves a good mystery. Not surprised my brother figured it out. Really enjoy your postings. Don’t you just love Google Earth! Last week we were roaming around in the San Juan Mtns above Durango trying to get over to the Telluride side of the divide. Got lost- bad, bad roads- sun was setting- so we did the unthinkable and backtracked. Next day I rode Google Earth for 2 hours to figure out the right route. Then the next day we packed heavy (coats, food, water) and started out again with my Google Earth research on elevations, turns, meadows, road names. So much fun. Ken, the curve you see at the right end of the bridge is a curve in what the locals called the “Little Ditch”. It was separated from the Diversion Channel by a lower levee than the one on the south side of the Diversion Channel. If you look at the left edge of the picture, just above center, you can see some white structures on the south side of MO-74. Those are the house and buildings on the Fred Robinson property. Ken, the mystery picture is Oak Hills. If I had refreshed my screen I would have seen that Mark Stuart figured that out 50 hours ago! It appears that neighborhood was still under construction then. I used to cut thru Oak Hills instead of using Perryville Road and Bertling to get over Bertling hill. It does look shorter by air. 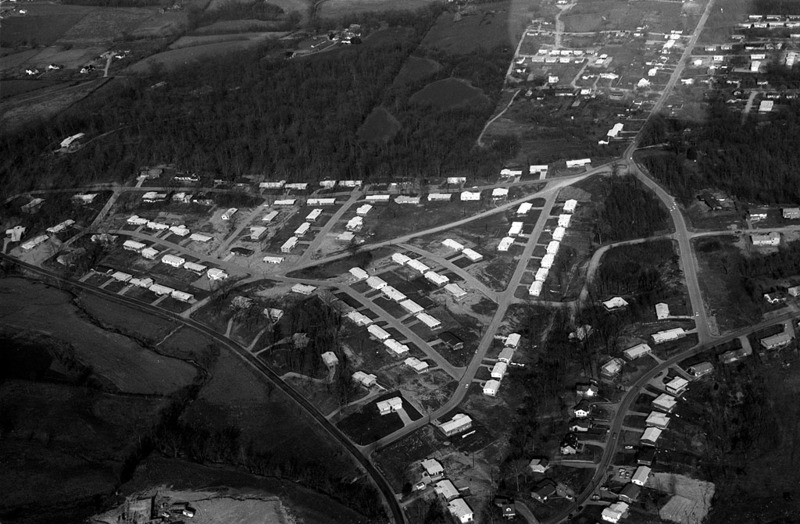 In 1962, Mark Campbell lived at the top of the hill where BelAir and Oak Hills intersect. Our gang would occasionally play poker at Mark’s house. Good memories! I’m fascinated by all of your devotion to your home town. I love following Ken’s offerings, and your responses. I left my home town and never looked back. I’ve never been to a HS reunion, and only visit relatives and a very few old friends when I return. I think “The Cape” must just be a more special place than my hometown of St. Albans, WV, that and the fact that I must have been born to be a wanderer. By following Ken’s hometown remembrances, I’m able to see how owning a place is very special for some people. Good on ya Ken! I think it’s more a matter of a place owning you, than you owning a place. So many places own a piece of me I can’t keep up. I posted a piece on justice finally coming to The Killing Fields of Cambodia. Cambodia really moved me.